Current augmented reality marketing campaigns drop products and other branded experiences into the consumers’ real world, creating a widely available immersive experience that is unique to the brand. These experiences are evolving as the next wave of immersive marketing is coming. Development tools like Google Anchors and ARKit 2.0 enable users to interact with one item in a shared environment across multiple devices. This collaborative process provides users with the freedom to interact with a digital marketing asset on their respective devices in a shared experience. Sharing a marketing campaign with multiple devices using AR has creative implications including home design. When consumers are looking to purchase new furniture from IKEA, they can access the same piece of furniture using the mobile AR app. 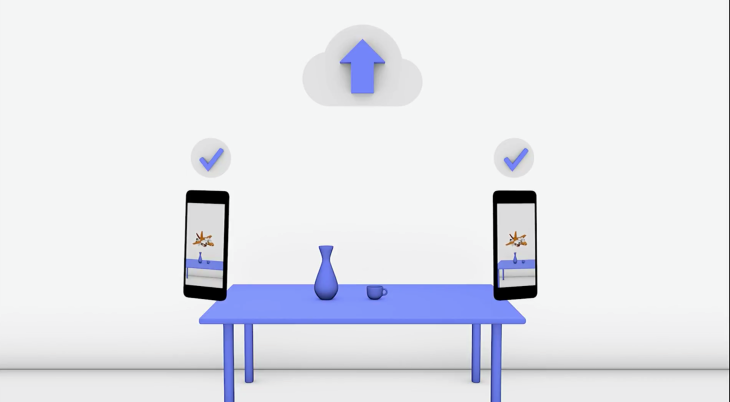 With Google Anchors, one user can move a piece of furniture to a certain location and all users will see the change in real-time. This social feature allows multiple users to visualize their work simultaneously – viewing a single digital landscape. This saves time and eliminates the need to gather around one mobile device, leading to a quicker purchase decision. There are companies that can benefit from implementing social AR marketing strategies in their current campaigns. Since 2011, Coke initiated a personalized marketing campaign with ‘Share a Coke’ by adding names onto the bottle where their logo resided. Coke can utilize augmented reality to enhance the story of the congruent TV commercials. Using Google Anchors, users can “share a Coke” with another user handing them a digital asset with their name on it. This social experience can leverage the current message of the multi-national campaign by promoting the notion of sharing by reaching to mobile users. Coke can extend the experience with branding opportunities to create a digital story based on the personalized coke bottle when a barcode is identified with a mobile camera. Branding experiences can also translate to AR multiplayer games. Companies with successful social campaigns like Cheerios’ ‘Good Goes Round’ can leverage augmented reality by gamifying the social experience to increase donations. Last year, Cheerios donated ten boxes of cereal for every photo and video that was shared with an “o” and the campaign’s respective hashtag. AR can have be beneficial to these types of campaigns with a social game where one or two users throw Cheerios into a cereal box – donating boxes for Cheerios made in a given time. This adds a new dimension to the campaign by creating an achievement to reach for the user while having the option to work with a friend to fight hunger with the company’s campaign. While companies have invested in either adding AR features to their mobile apps or developing a dedicated AR app, there are opportunities to enhance their digital campaigns. AR tools like Google Anchors provides the groundwork for companies to design immersive campaigns where collaboration is at the heart of the experience. This can be implemented into strategies involving brands, products, and social awareness. With the reach of the mobile market, there is an opportunity to achieve a growing ROI as digital assets can be developed and updated throughout the campaigns. Augmented reality mass adoption is here. Is your brand ready? Hear more about mobile AR marketing at VRS 2018 on Oct. 16 from Tony Parisi, Global Head of VR and AR at Unity Technologies. Purchase tickets today and save.